Dang. That was tough. I just finished my second Project Kratos workout following my return from a week of debauchery. For more context on this experiment and my full regimen, check out Part 1. I could not complete all of the exercises. Now I remember why I abbreviated to the condensed Kratos split 6+ months ago when I was living in London, UK. 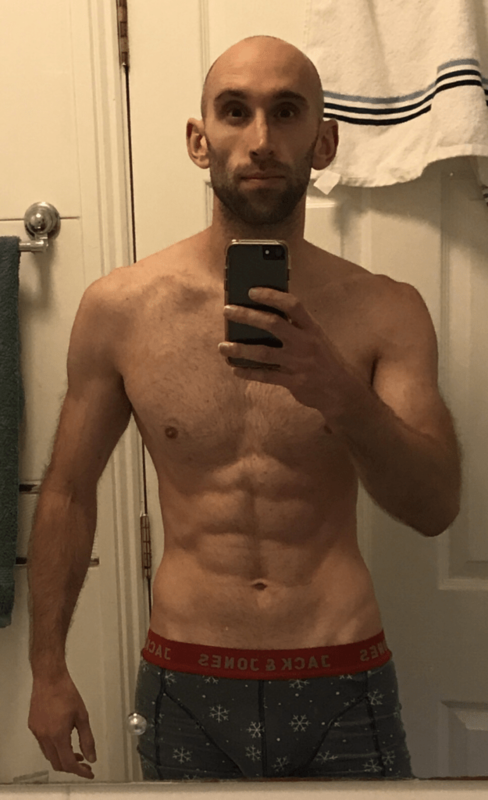 It would seem that due to my training level and thus ability to inroad my starting strength significantly and/or my fibre type (according to 23andMe, I seem to be more glycolytic and therefore fatigue quicker – see my podcast with Ryan Hall on this here: Part 1 and Part 2). I just can’t cope with too much volume in a single workout. Notes: Single set to failure on each exercise. No deliberate rest in between exercises but enough time to safely execute the next exercise. No specific cadence. I just focused on very smooth turnarounds. My cadence probably started at 3/2/3 and became progressively longer as the set progressed on all exercises. It feels like the first 2-3 exercises wiped me out, which is why I’m going to move to the condensed version of Kratos for my next A Routine. I will continue with the full version of Zelus until I experience the same problem. As per Part 1, I’m currently working out every ~3 days (I use an ~ because I really don’t care if I go 4 or 5 days without a workout some weeks). Please note, though I wrote 80% of this straight after my workout, I finished and published the post the evening of. As is my normal routine these days, I have intermittently fasted from 9pm yesterday evening to 2pm today. I did this bodyweight workout about an hour ago, so I will eat shortly (Ribeye and 4-egg omelette fried in coconut oil – YUM!). But as you can see, I really detach my eating schedule from exercise. This is because I’m not yet convinced that eating more frequently has any measurable impact on muscle hypertrophy or strength. And I enjoy the fasted feeling before, during and after training for a short time. I feel like my body is building muscle and the governor is liberating fat stores. Of course, this might not be entirely true and these processes are far more complicated. Post your questions/advice in the comments below. I would love to learn about your workouts and I am happy to elaborate on the above in as much detail as you like. Hello Lawrence, is interesting to see that you reduces the TSC from 30/30/30 to 30/20/10. How do you feel? What differences do you observe to do that? I suposse that you are following the TSC guidelines of Doug Mcguff. Hey Javi, well observed! My friend Scott M told me that McGuff has recommended 30/20/10. So thought I would give it a try. I think the effectiveness of the protocol depends on the exercise. For neck for example, I think 30/30/30 may be fine and not sure if 30/20/10 for neck is long enough for me. However, when doing TSC simple row, I found 30/20/10 to be a better fit, although that may be because I’m new to TSC simple row so 30/30/30 felt really challenging. I could not contract hard at all in the last 30s. Drew has recommended to me on our most recent 1-on-1 podcast (https://highintensitybusiness.com/podcast/drew-baye-high-intensity-bodyweight-training/) that in order to measure the effectiveness of TSC one should occasionally test strength with a full range of motion exercise, such as a 4-way neck machine for the neck or a seated row / inverted row in place of the TSC simple row. Anyway, it’s early days so I’m just experimenting and trying to find what works best for me. Awesome post Lawrence – love the blogs and keep them coming!! What part of 23andme did you look at to determine you’re more glycolytic? Thanks! Thank you Scott. I will, I love writing them. I sent my muscle fiber results to Ryan Hall and he told me so lol. I’ll paste my results in the comments when I can. Looking good lawrence ! bodyweight training is very underestimated . Cheers Enlite. It would seem like it has equal benefit to machine / free-weight based training. And it’s very mobile! I’ve been using push ups , pull ups , dumbbell rows , dumbbell pullovers and lateral raises to train in my basement for the past 8 years or so . I couldn’t agree with you more that body weight movements as a modality are just as effective as any other although some may disagree . Lawrence Neal —-> CT ——->	One working copy of alpha-actinin-3 in fast-twitch muscle fiber. Many world-class sprinters and some endurance athletes have this genotype. You are better suited towards HIT. Too much to say. LOL. Do you think if you increased the duration of rest periods between exercises you may be able to better cope with all of the Kratos exercises? Hey Julien – possibly, but I don’t want the workout to go on for too long. I just want it over and done with ???? I have probably ~1min breaks between some exercises to setup, record previous result, drink some water, etc. I just make sure I record overall time to track overall performance. Hi Lawrence, as promissed, here are some photos with a Champion and myself! 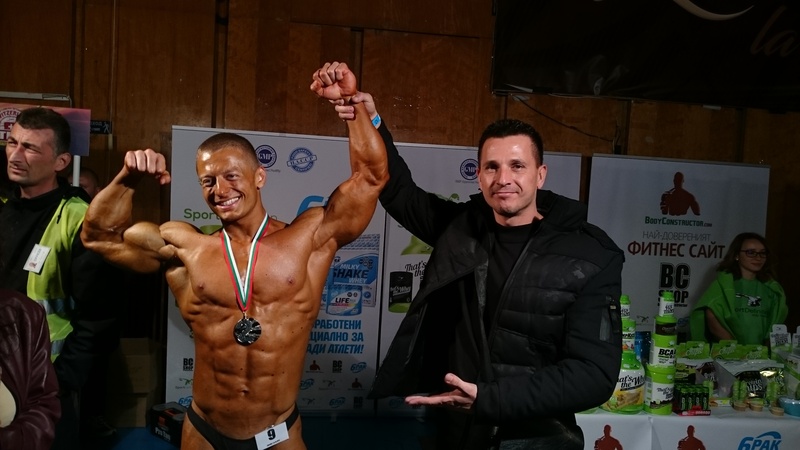 He came out second (arguably 1st) at 188/86 weight class “classic bodybuilding”. 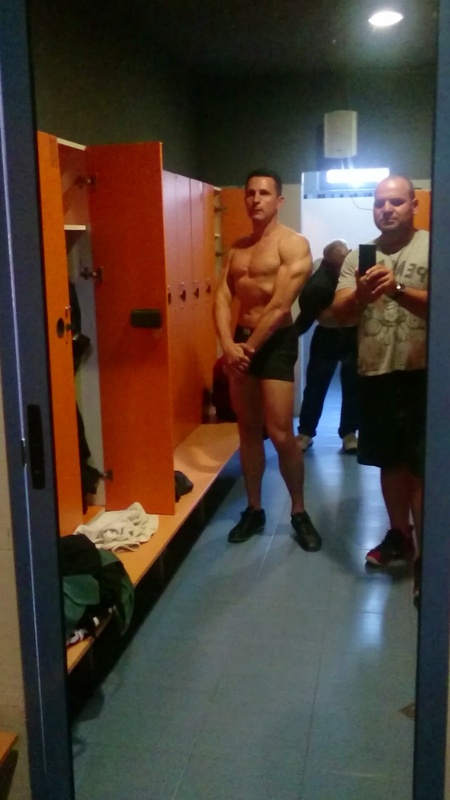 Champ – 179/88 kg at the photos, Top shape for contest, painted, cut etc..
Nice, great results. A really good testament for this kind of training. Thanks again for sharing. Thanks! It is the Lyfestyle and HIT training being part of it. The ratio Investment of time and money HIT wise, compared not even to “champion’s” but to typical trainee lyfestyle is the greatest Winner! Awesome! Great pic Kamen. You look great. Thank you for the lifestyle comparison too. You’re quite right – this is 80/20 at it’s finest. This is really interesting and affirming. Thanks for sharing. 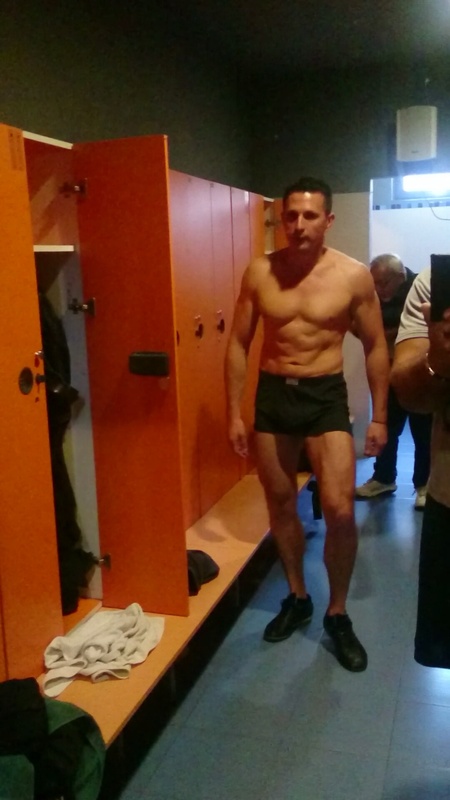 Kamen,great photos!Just wondering,do you do any form of cardio work? I’m 59 and just started HIT again ,and on each exercise you do, do you do just do one set?, keep up the great work! Hay Dean, thank you! Yes sir, it is 1STF for me. Very rarely I may use a second or third, not a set but rather attempt, like in a rest pause fashion. And mostly if I felt like I was not focused enough. No specific cardio sessions for me. I try to walk in my lunch hour brake. In addition I have a 3 year old at home, so he helps with my moving around. But no specific cardio exercise for that matter. In fact the last time I decided to strip down weight/fat, I choosed the lowest rating of activity in the calculator – sedentary and subtracted another 200 to be sure…and ended up at about 1600-1700/ a day. 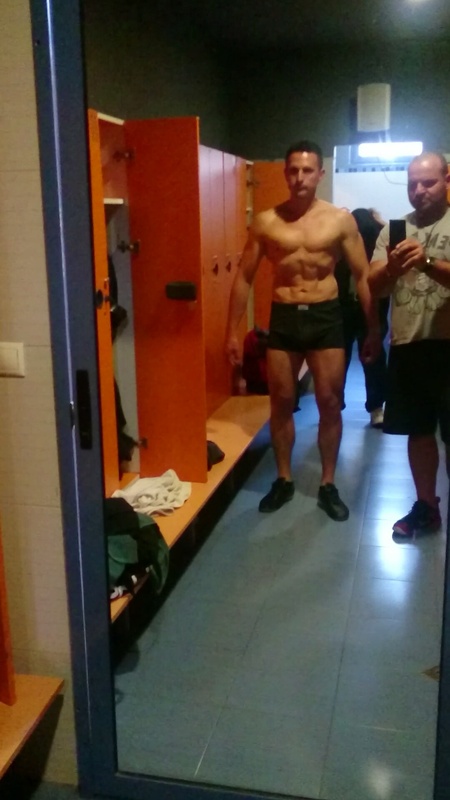 When I started to diet this last summer I was 39 years old,188/97-8 kg. 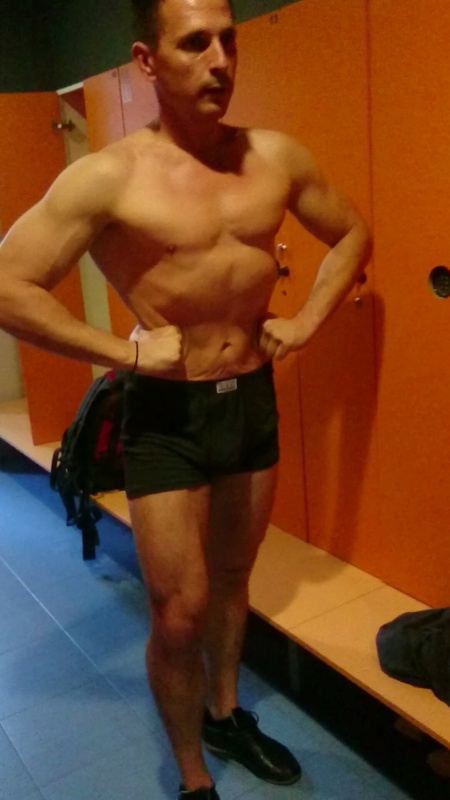 If you’re interested, I’ve shared my current workout experiment by Lawrence’s request over at Mr. America Jonh Heart’s interview section here at CW, in the comments. Kamen, Thank you for taking the time and giving me your information, looking forward to doing HIT again,I’m going to check out John Heart’s video,thank you again! Thank you Lawrence, I just found your website the other day and really like it,I just started HIT again ,I’m 59,and looking forward to doing HIT again,thank you and Kamen! I’ve done some Kratos workout, and had huuge gains in muscle and strentgh. 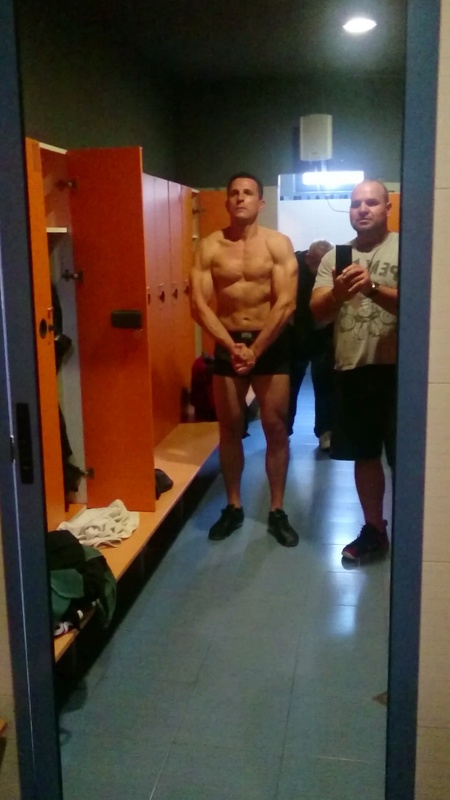 Buuut… After few months of training, I would need up to a week of recovery, because I would be destroyed. Part of the problem is that I work as physio(massage) therapist, and am pretty active. Also massages drain my energy quiet a bit, and such workout is just too much. So, I needed to adapt. I use Convict Conditioning tamplate pushups/abs, pullups/squats. Do one set to failure and then some Tabata protocols, just to get heart some pump and to sweat a bit. I do get some soreness next day, but it doesn’t affect my everyday activities. Workouts are done every other day, because I like to move more frequently, and all is done in less than 10 minutes. I must say, that this type of workout suits me really well, and I am much more focused, and it’s little easier, because I know that I have only two sets, so can do them with much more concentration. Thanks Dorde. So you workout ever other day like: HIT, day-off, Tabata, day-off, HIT?Interesting to learn about your specific use-case. I have found that for me, too much volume in a single session destroys me and I have to use less volume. I think that is largely a by-product of me becoming much stronger and able to fatigue my muscle far more per exercise. But, I am yet to test a daily HIT workout to failure, but based on my experience so far, I’ll probably stick with 2-3 times per week for now. So my workout would look like this. Pushups, set to failure; leg raises, set to failure; tabata Kettlebell swing one round, next would be mountain climbers, and alternating that for 8 rounds total. Tabata is pretty much changing every workout, depending how I feel. I am really active guy, so I have to manage myself, to conserve energy. In ideal world, with ideal nutrition and lots of sleep, I am sure I could do on regular basis whole kratos workout, but, we don’t live there 🙂 Keep up the good work! Cool, so just to clarify you’ll repeat that workout, so in effect you’ll end up doing 8 sets of pushups to failure after all rounds are done?